The session chat window serves as a running log of everything that happens throughout the session, including files transferred and tools used. 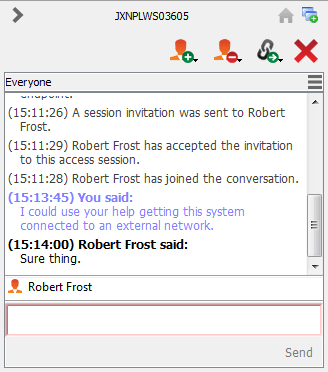 If one or more users are sharing the session, you can chat with the other users. When an additional user joins a shared session, they are able to see the entire chat history. When typing, misspelled words will be underlined in red. Right-click to view spelling suggestions or to ignore that spelling for the current console login. Messages appear as plain text in the chat input area. You can add or edit BBCode tags within a message to add text formatting. Formatting will be applied once the message has been sent.